The city of Chicago and the company it hired to operate the taxpayer-owned Divvy bike share program do not know how widespread the system’s rampant theft problem is, according to documents received by CWBChicago in response to a Freedom of Information Act request. The documents show that Divvy bikes are only inventoried once per year—on October 1st—and the management company does not file police reports when the program's $1,200 bikes (paid for with taxpayer dollars) go missing. That’s among the latest developments in the weeks-long Divvy theft epidemic that began when thieves learned how to compromise locks on the system’s docking stations. That’s really something special. Because CWBChicago’s editors have been plowing through criminal court files and we found 18 people who were arrested and charged with possessing stolen Divvy bikes between July 16 and July 26th. So far this month, 40 people have been arrested and charged with possessing stolen Divvies in the city, according to our research. 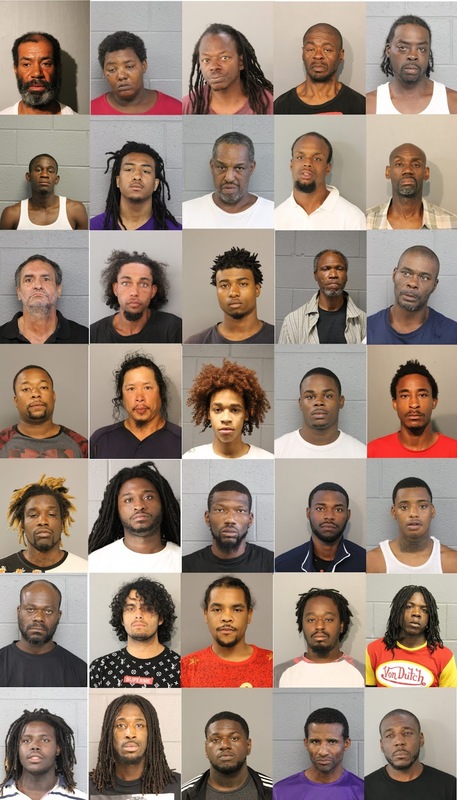 More on those arrests and our findings in a moment. The Chicago Department of Transportation (CDOT) admitted last week that neither it nor Divvy’s management company keeps track of the system’s assets in real time. Docking stations record when a bike leaves and when it is returned, but no one keeps track of bikes that go missing, and no one reports stolen bikes to the police department, according to CDOT. Only when police stop someone with a Divvy and then check the bike's rental status with Divvy dispatchers are stolen bikes recovered and arrests made. 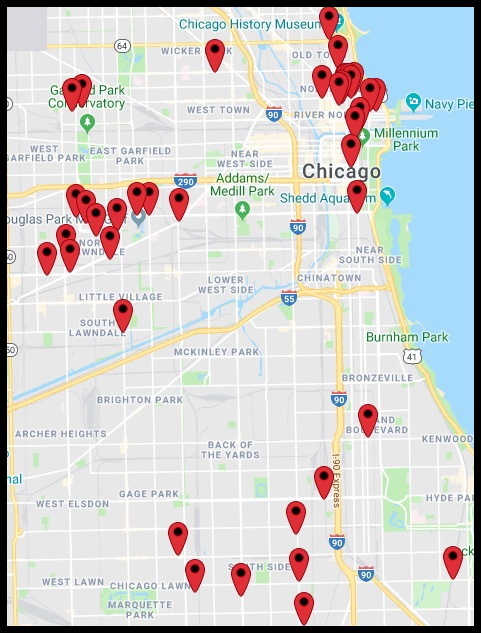 Locations of July 2018 Divvy bike theft arrests. Motivate, the company that manages the Divvy program for the city, is required to count the system’s bicycles once a year on October 1st. That’s when the company determines how many bikes are to be retired due to damage and how many are “missing,” which means they have been out of the system for more than 24-hours. The agreement calls for the city to pay for the first 1% of any missing or retired bikes with Motivate paying for the rest. There is an exception, though: Any losses that are directly the result of software or firmware problems are paid by PBSC Urban Solutions, the agreement says. Last October 1st, the Divvy system had 6,294 bikes of which 38 were missing and six were “untracked” at the time of the audit. Seven bikes were retired. Previous years’ reconciliations do not list the number of missing bikes. 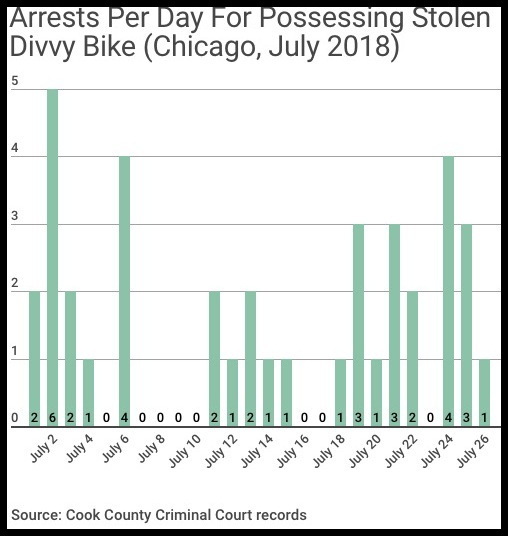 Needless to say, if 40 people have been arrested for possessing stolen Divvy bikes during July alone, and only 38 bikes were missing at last year’s audit, Divvy is currently facing a rampant theft problem. 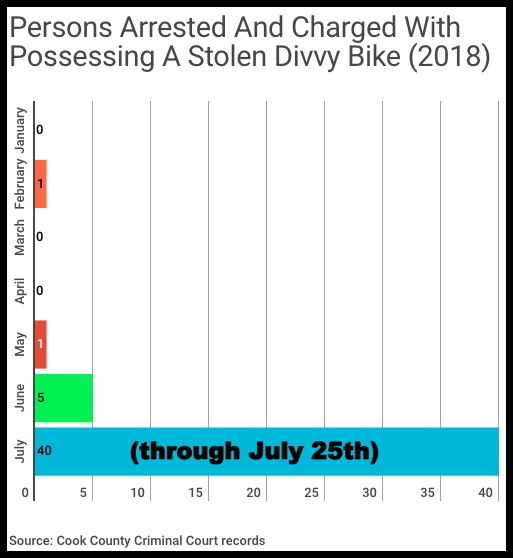 One can only imagine how many Divvy thefts are not ending with an arrest. • Of the 40 stolen Divvy bikes recovered with an arrest in July, the average bike had been missing for 12.3 days. • Of the six defendants whose cases have reached conclusions in court, two cases were stricken (one from February, the other from May); prosecutors dropped one case in June; two defendants received sentences of two days time served; and one received a sentence of eight days time served. When it comes to accused Divvy thieves, Leonard Edwards stands alone. 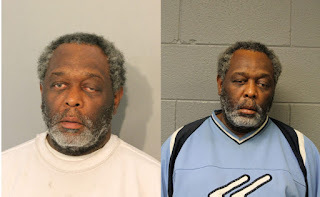 Edwards has managed to be arrested for possessing a stolen Divvy bike twice during July—once on July 14th in Streeterville and again on July 24th in the Loop. Both cases are pending.